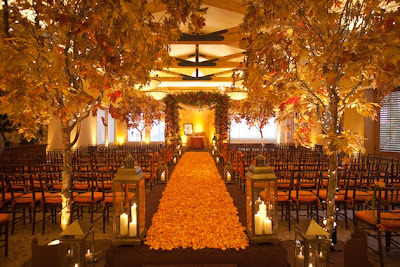 Think autumn harvest when brainstorming for fall wedding ideas. Fall wedding decorations can be more than colorful cut flowers. A medley of textures such as beautiful berries, fall foliage, and autumn accessories create the look of a bountiful harvest. How about seasonal fruits like pomegranates and miniature pumpkin as seating card holders? You can place each seating card on top of the pomegranate or pin it on a miniature pumpkin. These are great and unique ideas for fall wedding decorations. Another fall wedding decoration and centerpiece idea is to fill up different sizes of baskets with apples accented with autumn leaves. The guests can then take it home with them at the end of the reception. Another idea is, instead of baskets, use glass bowls and fill them up with different kinds of fruits like pomegranates, plums or gourds of varying sizes. If you want to go with candles for your fall wedding decorations, consider scented candles with scents like cinnamon or pumpkin spice. Surround the location with plenty of candle light to provide warm ambiance to the whole scenario. For a centerpiece, use a small frameless mirror and place candles of various sizes on top - the reflecting light is beautiful and exudes elegance, especially at an evening reception. More fall wedding decorations and ideas include using fake trees (you can get them from craft stores) or real ones and placing white twinkle lights on them. Use fall leaf garlands along entryways. Place clumps of berries on guest book table and cake table. A carved pumpkin with tea lights inside placed in strategic areas makes for a great decoration. There is an abundance of colors that you can use for your wedding. Think of the color of nature in the fall season, from the palest of peach to burnt orange, shades of red, brown, yellow and gold. Take your cue from Mother Nature. 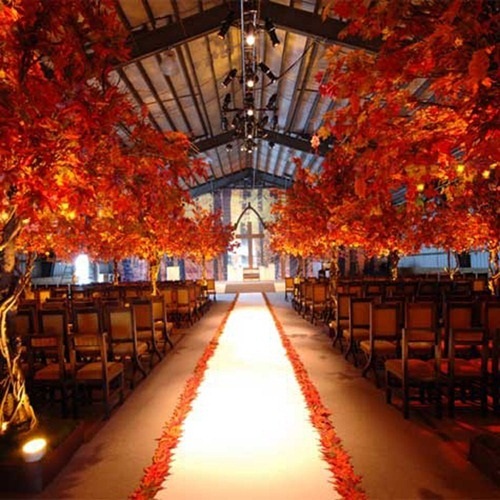 Whatever colors you find combined in nature will work for a fall wedding color scheme. Fall colors are burgundy, dark green, navy blue, silver, gold, cream, burnt orange, taupe, brown and plum. The thing about wedding favor is that brides worry too much over them. Cherished wedding favors are those special wedding tokens that guests do not throw away as soon as they leave the wedding reception. Just remember to keep the favors simple and useful for the guests. Ideas for favors include homemade jams and maple-leaf shaped cookie cutter.